Bell Flow systems now offers the Insertion Electromagnetic Flow Transmitter, Series IEF, manufactured by Dwyer. The meter is designed for ease of installation and accurate flow measurements and was recognised earlier in 2018 for excellence in product design at an awards program sponsored by The Air Conditioning Heating & Refrigeration News magazine (The ACHR News) in the US. The IEF meter is an adjustable insertion flowmeter suitable for inserting into pipes from 4-36” on most pipe materials and can be used with various conductive fluids. The digital display guides the user through a setup wizard to configure the meter and setup and alignment kits are available to provide simple installation. Being field configurable with integral or remote setup displays and with the ability to be installed and removed while the system is pressurised allow for great flexibility. The IEF meter is an ideal solution for accurate flow measurement in applications such as HVAC, irrigation water monitoring and clean water measurement. 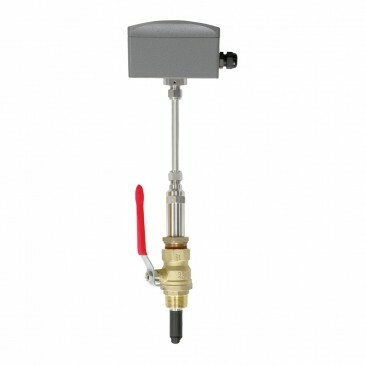 The flow transmitter also offers analogue and digital outputs and optional BACnet MS/TP or Modbus RTU communication protocols allowing it to be integrated in to existing management and monitoring systems. The shaft, fittings and electrodes are manufactured from 316 stainless steel. Designed for long life with no moving parts and electrodes designed to prevent fouling meaning minimal maintenance is required. A truly versatile instrument for many applications providing an accurate, user friendly and cost effective solution.